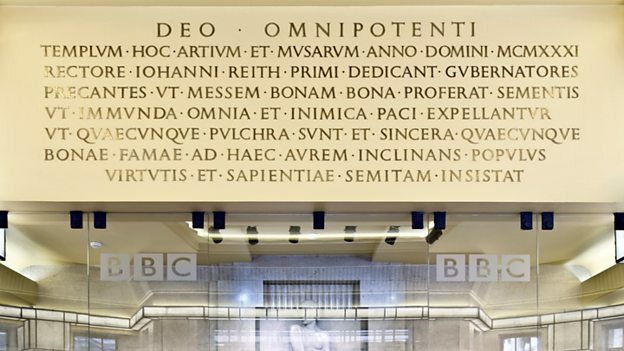 The BBC has changed over the years, but one thing many in the country may not be aware of is the Christian foundation upon which the corporation was founded. 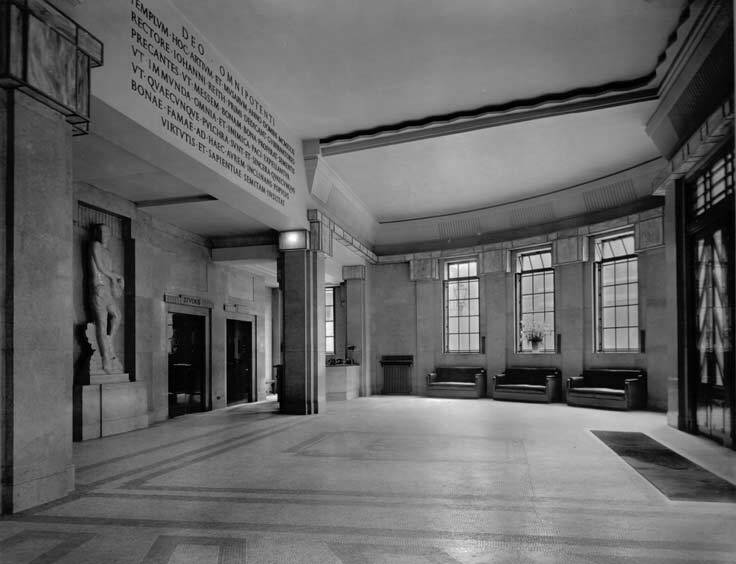 This Temple of the Arts and Muses is dedicated to Almighty God by the first Governors of Broadcasting in the year 1931, Sir John Reith being Director-General. It is their prayer that good seed sown may bring forth a good harvest, that all things hostile to peace or purity may be banished from this house, and that the people, inclining their ear to whatsoever things are beautiful and honest and of good report, may tread the path of wisdom and uprightness. 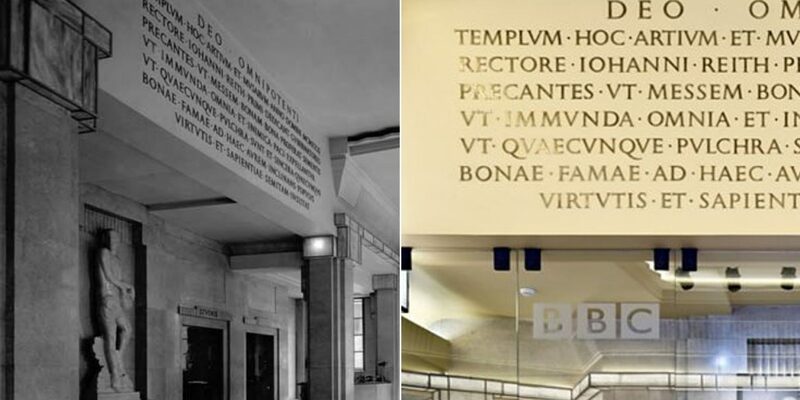 This inscription, which has references to Philippians 4:8, remains in the same place today as it did in 1932, surviving the 2010 refurbishment. It shows the strong sense of Biblical values held by the founders and belief that the corporation should be a force for good, for uprightness and honesty. It is said Sir John approved of the sentiment, wasn’t sure if the BBC could live up to it. He was right. The BBC has failed in its standards of reporting honestly and accurately in regards to the truth concerning Israel. But it is a mission statement that is as necessary and relevant as ever. If the BBC is to become a reliable and honest source of information on Israel, it must reform and get back to its vision. Furthermore, there is must hostility towards the truth that must be “banished” from the “house”. This is why CUFI’s campaign launched on Friday, partnering with the IBA, aims to tackle the appalling bias against Israel that has been evidenced for too long. Funded by the British public, the BBC is not living up to its founding principles in its coverage of Israel. Its unbalanced reporting is leading people to the wrong conclusions about what is happening in the Middle East. The BBC is failing, deliberately in our opinion, to “inform and educate”, leading many people to the wrong conclusion about the threat Israel faces and how it responds. Furthermore its biased reporting is fuelling antisemitic discourse in the UK. Not only is the BBC is misleading its worldwide audience, but it is breaching also its Royal Charter, which is supposed to “provide impartial news and information to help people understand and engage with the world around them”. CUFI has chosen to focus this campaign on the BBC’s coverage of rocket bombardment into Israel from its southern borders. In the last two years the BBC has published only eight stories highlighting the security challenges that Israel faces from rocket attacks from Hamas, Islamic Jihad and ISIS. However, on only one occasion did the BBC lead its report with accurate order of events. On seven occasions their reports led with the Israeli military response instead of the initial attack against Israel. Worse still, over that same period there were nineteen additional attacks on Israel that the BBC chose not to report on at all. For more information about the campaign and how to email your MP and the BBC using our customised email, please click here.